I love these burgers. I hate these burgers. After several batches that were either too crumbly, dry or bland, I had just about given up on them. Finally (finally! ), on my last willing attempt, they turned out just right. I was still mad at them for giving me so much trouble along the way, but I couldn’t keep these burgers from you. They’re too good. The concept came to me last month, when a new publication requested a new veggie burger recipe. I wanted to make a falafel veggie burger. 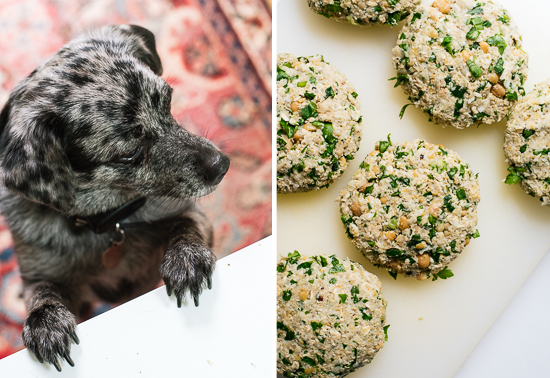 You might think that you could just make bigger falafel and call it a veggie burger, but I vividly recall making bigger versions of my baked falafel way back and that didn’t work at all. The small falafels are perfect, but in larger form, they’re gummy on the inside and require far too much chewing to get down. Nope, those just won’t do. 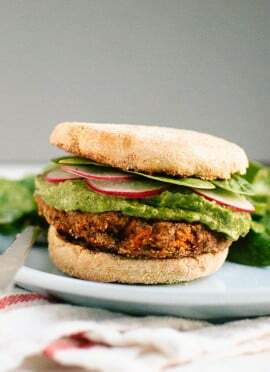 I decided to base the burgers off my sweet potato and black bean burgers, which are my idea of a perfect veggie burger, and pull in flavors from the baked falafel. I’d use cauliflower to lighten up the texture so the burgers aren’t so dense in the middle. I turned them into “rice” (basically, just cauliflower pulsed into little pieces in the food processor) à la Laura’s cauliflower veggie burgers. Then I used chickpeas instead of the black beans and added extra parsley, cumin and a dash of cinnamon. Covering the patties while they cook in a pan on the stove helps the cauliflower cook through and lose its distinctive raw flavor. Bingo! Perfect falafel veggie burgers. I hope you agree. I haven’t tried cooking these on the grill (I think the patties will need to be chilled beforehand so they hold their shape), so please let me know if you give that a shot. 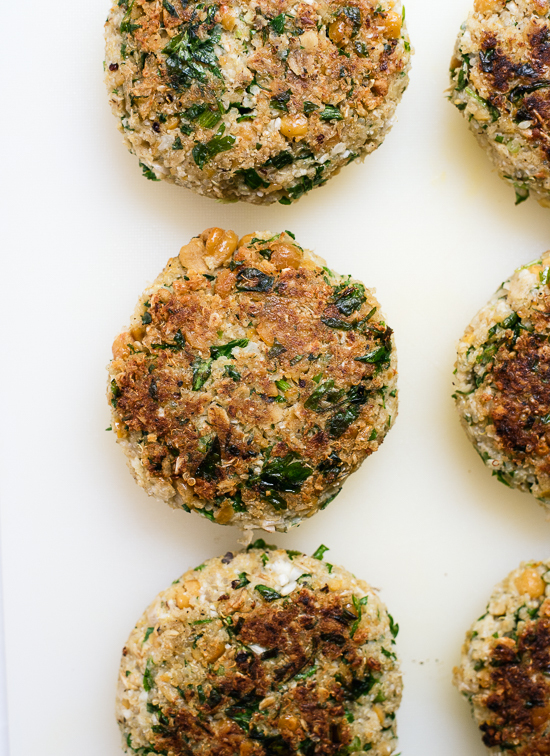 Cauliflower lightens up these herby, falafel-inspired burgers! They’re great in between hamburger buns or on salads. These burgers are egg-free, vegan and gluten free (if you use certified gluten-free oats and gluten-free buns). You are going to need a food processor to make these, I believe. This recipe yields about 7 burgers. 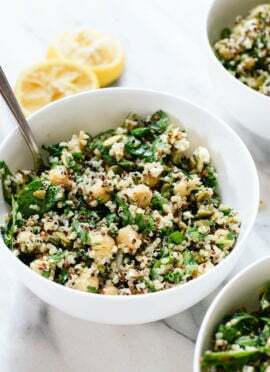 To cook the quinoa: Rinse the quinoa in a fine mesh colander, then combine with ⅔ cup water in a small saucepan. Bring the mixture to boil, then cover and reduce heat to maintain a gentle simmer. Simmer for 15 minutes, then remove from heat and let the quinoa steam with the lid on for 5 minutes. Then drain off any excess water and set aside to cool. To prepare the cauliflower: Transfer the cauliflower florets to the bowl of your food processor. Pulse until they resemble a couscous-like texture, about 15 pulses. Pour the mixture into a large mixing bowl or the bowl of your stand mixer. 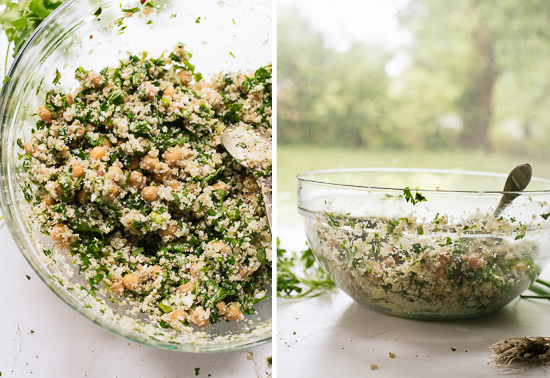 Keep the food processor bowl handy because you’ll use it again soon. 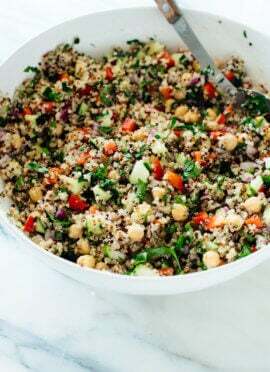 To the mixing bowl, add your cooked quinoa, chickpeas, green onion, cilantro, parsley, garlic, olive oil, cumin, salt, cinnamon and red pepper flakes. Stir to combine. Use a potato masher or the paddle attachment of your mixer to mix really well. You need to mash up those chickpeas so the burgers hold together. Mix in the oats: Sprinkle the ground oats over the mixture and mix well with a big spoon until the mixture holds together when you shape a portion into a patty. If the mixture is still too dry to shape into patties, mash it until it does. If you have time, cover and refrigerate the mixture for best results (the patties will hold together better during cooking if they are chilled first). Shape the burgers: Use a measuring cup to measure out ½ cup of the mixture. Gently shape it into a patty about 3 ½ inches in diameter. Use your hands to gently flatten the burgers and smooth out any jagged edges. Repeat the process for each patty; you should end up with seven. Pan fry the burgers: Heat 1 ½ tablespoons oil in a large cast iron or non-stick skillet over medium heat. When it’s hot, place several burgers in the pan, leaving enough room to flip them. Cover and cook until the patties are golden brown on the underside, about 3 to 4 minutes, then flip, add a splash more oil, cover again and repeat with the other side. Add at least 1 tablespoon oil to the skillet for each pan of burgers you fry. Transfer cooked burgers to a plate to cool. Serve as burgers or on salad. Recipe adapted from my sweet potato and black bean veggie burgers and crispy baked falafel. These look delicious, I want to try them but I’ll never eat 7 of them in one go. Do you think they would freeze well? Just to be clear, freeze before cooking, right? I think I would cook them first. I’m not sure how well the raw burgers will defrost and then cook. Hello, new favorite burger! 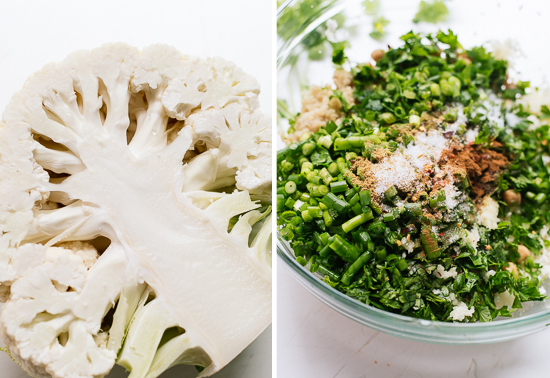 These sound fantastic – and I’m loving this use for cauliflower! Love these! I have the same problem with veggie burgers being “undone” in the middle and too done on the outside. Glad you found the solution! 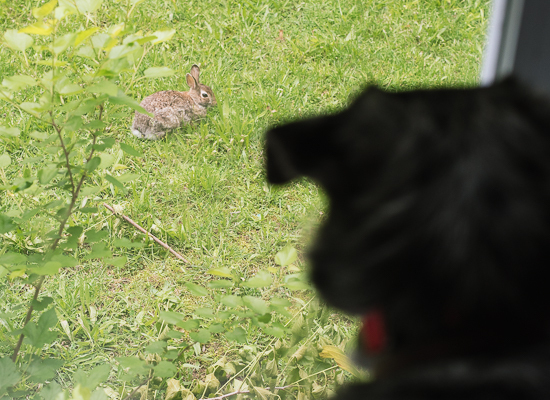 Gotta love the pic of Cookie eyeing the rabbit! Yep, try covering them while they cook! Thanks, Amy! Hey Kate! These burgers look beautiful- thank you for toiling in the kitchen and getting the recipe out to us. This summer has been so incredibly busy- it’s so hard to keep up with you. Hey PL! I’m always trying my best. Hope your summer is busy in the best of ways! Kate! Your recipes are always so pretty and look absolutely divine. I love a good veggie burger. I will have to try this one out. Yes, I think these would freeze very well! I would go that route. This looks absolutely delicious! What can’t you do with cauliflower?! Can’t wait to try it! How fun! I love the flavor of falafel! 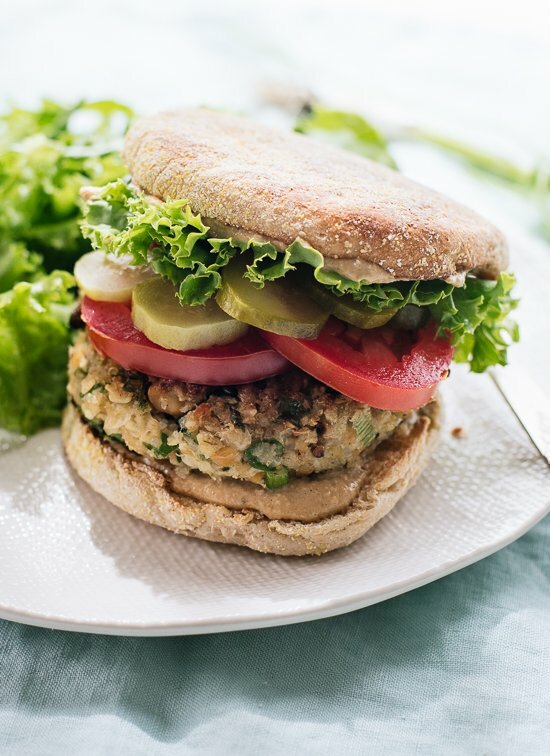 These look so yummy – my patience with making veggie burgers wanes sometimes but I’ll definitely try this recipe out! Great recipe! Perfect for a vegetarian summer BBQ! Thank you for powering through so many versions of this recipe to bring it to us! Oh falafel inspired burger…come to mama…. Kate, these look amazing! I love that they are lightened up with the addition of cauliflower, and chickpeas are my favourite protein. These are the perfect burger for me! I was so excited to try this recipe because cauliflower, but I had a real consistency issue last night when I made these. I usually take liberties with new recipes, but this one I actually followed exactly. But the burgers were so dry I had to add one egg and one egg white to get them to stick together. Did you have this issue? Not sure where I went wrong! Thoughts? Oh no! I am so sorry to hear that, Laura. I’m glad that you salvaged them. No, mine weren’t dry at all. The cauliflower “rice” seemed to add a lot of moisture. I really mashed the chickpeas so they helped the burgers stick together. I am going to revisit the recipe and try to figure out what went wrong! Boo, I’m sorry to hear that! Ok, I added another note after the oats step to suggest that the mixture might need to be mashed even more to come together properly. Do you think that could explain your issue? I really appreciate your feedback, Laura. I mashed the chickpeas separately with a handheld blender, and then added them to rest of the ingredients. They were basically a paste and everything held together very well! Oh my! I enjoy absolutely every recipe that you post but just wanted to comment on how gorgeous Cookie is! She looks so inquisitive and I love that she enjoys her veggies so much. I too have pups that hover expectantly under the chopping board for a broccoli stalk or a carrot top and then crunch them down with much gusto. Some people think it’s odd but I think it’s awesome. Thank you! :) Cookie is snoozing next to me now. She’s obsessed with food and will go after any and all food that she can get to! I’m always happy to give her my vegetable scraps! I figure they’re as good for her as they are for us. Well, I’m sorry the recipe development was so frustrating, but it sounds like the results were worth it! These burgers look fantastic — and they’re such a great way to use random CSA cauliflower. I’m definitely going to put them on the list! These are awesome, Kate! What a fun take on falafels!!! I gave these a try because when your blog post showed up in my email I knew I had to try theses! Falafel is one of my all time favorite foods! But getting the right texture to falafel is so hard! Even restaurants struggle with it! I pulsed the cauliflour and I cheated and pulsed the chicken peas slightly.. Then I whizzed the oats, hmmm this is a new technique. I got impatient waiting for my quinoa to cook so it was a little wet when I added it which may have contributed to my first problem (I’m also not sure but I think I added more herbs than called for because, you know, who doesn’t LOVE herbs! I mixed it up and started forming burgers and they weren’t holding shape… Oh crap what now! Eggs and flour to the rescue! These bad boys fried up great in coconut oil and got nice and crispy. I didn’t cover the pan but I did put the burgers in a 300 degree oven while I fried the next batch. Instead of a bun I used cranberry bread because I love all sandwiches with a sweet nutty bread! Toppings included avocado, spinach, jalapeños, a little mayo and tomato. Can’t wait for my next #cookieandkate adventure! Hi Mary! Thank you for sharing your photo with me on Instagram! I’m bummed that the first C+K recipe you tried gave you trouble and I’m determined to figure out what’s going wrong! So glad you got them to work for you and hope you love my other recipes! It looks so yummy and delicious.i will sure try this recipe. Made these for dinner tonight, they were delicious! 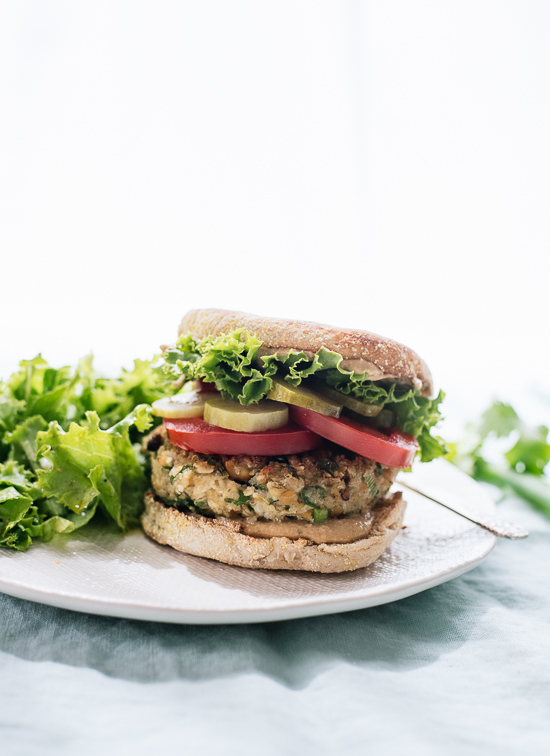 A veggie burger that actually tastes great, not just okay! I used brown rice instead of the quinoa because I was out and I made small patties with my ice-cream scooper for convenience. I also crumbled in so feta. Yay! Thank you, Anna! I bet your brown rice version is great. These were fantastic. Best veggie burgers I have had in a long time. Hi…do you think it would be possible to use the new frozen product at Trader Joe’s, organic riced cauliflower for your fresh? It would save some prep time…if so, any idea of the amount to use of the frozen to equal your fresh? Thanks! Hi Jerilyn, that’s a good question. I haven’t tried that product yet, but I’m guessing it would work. You would need about 3/4 pound (12 ounces) rice cauliflower for the burgers. Thank you, Heidi! So happy to hear it. I can’t wait to try this recipe! I’ve just recently decided to become a vegetarian and your website has been a lifesaver!!! Yay! Thanks, Amanda. Hope you love them. These were terrific! I served mine with a tahini sauce that was a great accompaniment. Next time I may add some nuts to the recipe. Thank you, Vicki! So glad you enjoyed them! I bet nuts would be a tasty addition. SO funny, I just posted falafel burgers today also and stumbled across this! Great minds. Ours are totally different, though, which means I MUST try these!! This sounds so yummy! Love that burger recipe – it looks so easy! And your food photography is seriously impressive. Your pictures are making my mouth water! I m going to make them tomorrow night. This looks incredible! I always find vegetarian burger patties always tend to fall to pieces, but I will definitely give this one a shot! Thanks, Orlando! Unfortunately, I’ve gotten a few reports of these burgers falling apart, and I still haven’t figured out why! It’s driving me crazy! Very tasty recipe – I loved these! Unfortunately, I had the same issue with the burgers staying together – they held together great until they were in the skillet. I even made mine smaller to try to get around that issue, but no luck. Oh well – as a crumbly, crunchy mixture, they make a great filler for wraps and/or salad topper! Lisa, I’m so sorry to hear that your burgers fell apart! Ugh! I don’t know what’s causing the issue. I’m glad you’re making do with the filling! I love making veggie burgers and always have a stash in the freezer… Though I must say, these didn’t make it to the freezer this time. I lunched on these little guys atop greens all week and had them for dinner with the husband (the guy who grew up on steak and potatoes and now is mostly meatless thanks to you and cookie!). The flavor combination is beautiful and the density is spot on. The first cooking batch fell apart in the skillet a bit, but after that they really held up well… The mashing-until-your-arms-hurt followed by a good hour of chilling I think did the trick. Thanks so much for this recipe!! Looking forward to more! Yay, so glad these turned out well for you, Emily! So glad you didn’t give upon these — made them last night and they were fantastic. The cumin and cauliflower combo led us to use mango chutney as the condiment on the hamburger bun. Big hit! As always with your recipes. These days food is so pricey that I’m reluctant to buy a whole whack of ingredients unless I’m confident about the recipe. Have made maybe 6 or 7 of yours now and each one has been standout. Nice to be able to count on something in life ;) Thank you! Thank you, Anne! :) I’m so glad they turned out well. I never would have thought to add mango chutney, but that sounds like a great idea. Really happy to hear that my recipes are turning out well for you! I try my best to make sure they do!!! Oops forgot to rate it. Here you go. I will be trying this recipe some time soon, as I still have some veggie burgers in the freezer. For those of you who found the mixture too crumbly, try this. Mix 1 TBSP of ground flax seeds with 1 TBSP of luke-warm water. Let sit for 5-10 minutes. After you have mixed everything together, add in the flax goop and mix well. It will all come together and hold well. I usually form all the burgers on a tray, and keep in the fridge for about an hour. Oops, there is a typo. I should have typed – mix 1 tablespoon ground flaxseeds with 3 tablespoons lukewarm water. Thank you, Fareeda! That’s a great tip. Trying these tomorrow night, can’t wait! I’ll take a risk and do what I usually do and bake them….wish me luck! Hope they turned out well, Nella! I had better luck panfrying. Eek. So I tried them last night and they were delicious and loved by everyone! Will definitely be making this again when I buy cauliflower. Thank you, Nella! I’m so glad they turned out well for you! Hi! Im so excited to try these! I’m new to veggie burgers, do you cook the oats or leave them dry? Thanks and I love your site! Hi Mary! I’m sorry I didn’t answer your question sooner. No need to cook the oats! Hi I have just found you and this is my third recipe I have tried. Love them all your amazing. I followed everything you said to do to a tee. They were so yummy and a hit with my two health conscious teenaged daughters. I had no trouble having them stick together but I mashed the chickpeas well and I do think refrigerating the bach for a while before making them into patties was key! Thank you, Christine! Delighted to hear that you all are enjoying my recipes. I’m so glad the burgers worked well for you! I followed the recipe to the tee and these came out fantastic. I don’t have a scale so I had to estimate the amount of cauliflower but I used about 1/2 of a large head as written. I used a potato ricer to mix everything together – I didn’t want it to be thin enough to pass through so I scooped it out – this worked perfectly. I froze some of them and have reheated in the microwave – perfect! I don’t like cauliflower so this is a perfect recipe for me. I will definitely make again. Thank you, Randi! I’m so glad this one turned out great for you. Hi Kate — these were delicious! Thank you. I substituted millet instead of quinoa like in the sweet potato black bean burger recipe (cheaper and had it on hand). I’ve been a vegetarian for about a year now, and your blog is definitely my favorite. Your recipes are so approachable. Thank you!!!!! I made your amazing sweet potato/black bean burgers last week so I decided to try these out today – unfortunately I just could not get them to stick. :( Even after using the flax-egg suggestion, they would crumble as soon as they hit the pan. Disappointing, though now I have a whole bunch of yummy cauliflower rice to eat through the week. I’m wondering if soaking/mashing the chickpeas prior to mixing all ingredients together might help? Has anyone tried this? Hey B, I’m so bummed these didn’t work for you! I haven’t been able to figure out the difference that makes them stick for some but not others. I think mashing the chickpeas before mixing is a good idea. These are fantastic. My family loved them !!!!!!! I used an egg replacer to keep them together and keep them vegan. I have to admit I didn’t try real hard to get them to stick together. The egg replacer was a lazy easy fix. The egg replacer has no taste so it did not change the taste. Thank you for another great recipe ! These were perfect. My husband and I loved them, and our 12 month old devoured a whole patty. So odd that others are having texture issues. For me the texture was perfect. They held together beautifully. We ate them with a yogurt, garlic, lemon juice, salt, and cayenne topping. Loved it! Made some to freeze as well. Kate, I made these veggie burgers and ate them over a bed of salad. Super delicious–especially with a pat of greek yogurt. They were also really delicious inside a pita (day 2 leftovers). These taste delicious! Unfortunately, I wasn’t able to keep them together. The mixture shaped into patties pretty easily but when I went to flip them to brown the other side, they fell apart. I tried baking them as well, but with the same result. I only added 1 cup of oat flour rather than the full amount the recipe called for because the mixture seemed close to being too dry, but is it possible this is why they didn’t hold together? Made this for dinner tonight. The whole family, adults and kids and baby enjoyed it. I did have to make a couple of changes–because I was out of cilantro–but adding that would have only made it better. I doubled the recipe because I had a whole head of cauliflower to use, but I forgot to double the quinoa. Also, I blanched the cauliflower florets before blending them. I thought it would make them stick together and cook more nicely. All held together well and made nice patties. I did try to use the stand mixer at first, but that did nothing to the chick peas, so I had to mash those anyway. Thanks for the fun way to use cauliflower! Absolutely terrific. I made these this week – your recipes are spot on. And yes, I froze the left over burgers and they were equally yum. I also did a batch of baked ( per your baked falafel recipe) and -again equally great. Thanks for consistently terrific wonderful recipes!!!! Just made these burgers today and I have to say, “they are fabulous!” I didn’t have a problem at all with them falling apart, although you do have to be gentle when cooking. I think the key is to really get those chickpeas mashed up well. I even spaced & forgot to grind my oatmeal…just put it in whole, and they still pattied out fine. I love falafel & these are just a great tasting burger version if that! Thank you for taking the time to perfect this recipe! Love your site! Thank you, Rhea! I’m so glad these turned out well for you! Loved these and so did my dinner guests. I served them with a peanut satay sauce I made up. Were delish. Happy to hear it! Thanks, Rikki! I would like to try these! 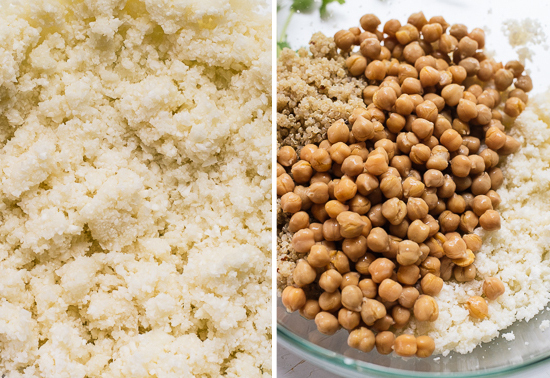 Would it be possible to replace the chickpeas with chickpea flour? I want to make them today and I don’t have chickpeas. Ok these were SO yummy the first time I made these, I am making a double batch today I can freeze some. I am trying to triple clarify (I’ve read through some other comments)… make them all and then freeze. Or freeze and then make? I made this for my birthday dinner (sans food processor, but a LOT of elbow grease) and it was a hit! It felt like an ambitious first time meal to make for a crowd but everyone, myself included, loved it. Some fell apart during the frying process, but the majority came together nicely. I’m sure if I had stored them in the fridge for a few hours this would have solved my problem. Served mine without buns, and put out greek yogurt and goat cheese for garnishes. I just made these for supper. They were delicious. The flavours were just right. I did have trouble with them falling apart in the pan. I served them on their own with some salsa and sour cream. Sounds wrong but it was really good. Do you think it’s possible to bake the patties instead of pan frying them ? Yes, probably so. I would brush the patties lightly with olive oil so they brown nicely and bake at 375 for maybe 20 minutes? Just guessing on the timing. My vegan daughter and Christian daughter talked me into a challenge for Lent. Being a KC BBQ guy at heart, Q’ing meat has always been my thing. So, I decided to go vegetarian for Lent. I was looking for something to put on the grill and eat in a bun. This was the real deal. I actually cooked these on my big green egg. No issues with them falling apart, but had to be very creative flipping them on the grill. I forgot to add the oats in the first batch I cooked. Added some to the second set. Got to say the first ones held together better on the grill. Who knows, but either way they were really good. Added some Jack Stack BBQ sauce and pepper jack cheese to one and it was amazing. Thanks for the great recipe. I’m so glad this worked so well for you, Rich! These burgers on the grill sound delicious. I love this site and all your recipes! I was really psyched about this one, and the flavors were absolutely fantastic, but my burgers totally fell apart in the pan. I squished them as well as I could and they seemed moist enough, but when I went to flip them, they just crumbled. I wound up making a pretty awesome hash out of the broken up burgers, but I’d like to try again for the real thing. Any suggestions on making them stay together? I know this is a vegan recipe, but would eggs help? Thanks, and hugs to Cookie! I have an idea: what if you cook the cauliflower just for a few mins and then grind it and mix it with the rest of the ingredients? Won’t that soften up the patties a little bit and help them hold up better? You could, but I would actually be concerned that would make the mixture more wet. If you want to add a whisked egg, that would help bind the ingredients. I’m sorry that this recipe is a little tricky! Best veggie burger I’ve ever tasted! (I’m 54!) husband and kids agreed! I have followed the recipe, but I can’t get them to form burgers. The mixture won’t stay together. I added some olive oil, but it’s not helping. Any other ideas to be able to form patties? I have a bowl of the mixture and not sure what I should do next!! These look so good! 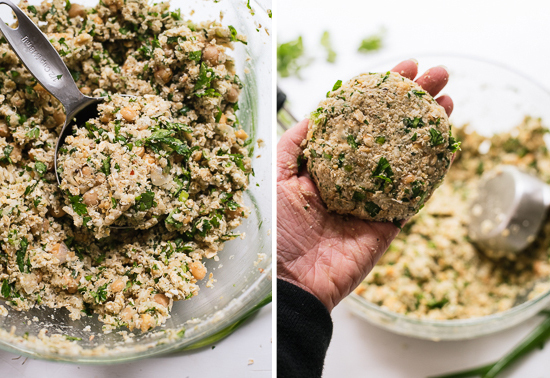 I’m always happy to try a new falafel recipe :) Can these be baked similarly to your black bean & sweet potato veggie burgers or do they need to be pan fried? I bet they could be baked! I’m just not sure, since I haven’t tried, but please report back if you give it a try. Making these tonight, but I might freeze a couple. Do these hold up well in the freezer? I don’t freeze all of my recipes so I can’t speak specifically to that. But let me know if you do freeze them and how it works! I’m glad you like them, Ava! Thanks for your review. I’m trying these asap because they look and sound so very delicious. I will top the burger with some dilled tahini mayo and serve on homemade vegan burger buns. I am so hungry for them and I wish it were tomorrow already! I’ll write again afterward with my verdict. Yes, please let me know the verdict, Adrienn. YUM!!! I could taste the individual ingredients which make these have such a wonderful flavor. I topped them with fresh spinach, onion, and thinly-sliced tomato. I also made tzatziki for additional Greek-style deliciousness. My son and daughter-in-law are visiting next weekend and I’m definitely making these for his 30th birthday celebration supper. Maybe some sweet potato fries to go along with it? Double yum! This recipe is a keeper. Thank you, Cookie and Kate! These burgers, as usual, taste fantastic. The only problem I have is that they do not hold together very well. I think it’s because I didn’t pulse my cauliflower enough in the food processor so the big chunks are preventing it from clumping together. Then again I pulsed the Chickpeas in the food processor and I use 2 eggs plus tahini to hold things together (and to add flavor per the tahini). But either way, if you press them together tight enough they hold together okay. I also put them in the broiler in our convection oven. Good times. Thanks again for a great recipe. Hi Kate, this is such a lovely recipe! Made the falafel today for dinner and everyone loved it! As we are out of town in a remote area I could not find cumin in the local store but substituted for other spices and it was really delicious. I’m glad my husband (a big meat-eater) appreciated this too, meaning I can cook this recipe more often! Thank you! Seriously the BEST falafel burgers! Light, not dry and tasty. I did the last step with the food processor as my standing mixer is ‘on the blink’ but i found that doing this made for a good consistency that easily stayed together and made patties perfectly. Your recipes are the bomb! I would’ve taken a pic but the vegan in the house ( as well as the carnevores!!!!) demolished them before i had a chance. Next time i promise. Thanks, Kari! It’s great these turned out for you and that you love them. Thanks so much for your review. Wish I’d read the comments before making these. Mine also were a crumbly mess in the pan, despite mashing up the chickpeas vigorously with a ricer and fork. Should have used a hand mixer and added an egg and maybe they would have stuck. Also found them ok but under-salted and not as flavorful as I’d hoped. Wish people wouldn’t leave reviews on how a recipe looks – much more helpful reading comments from people who’ve actually tried them. Although I love many of Kate’s recipes and even have the cookbook, these were not my favorite and I probably won’t make again. Still searching for that elusive perfect veggie burger that is flavorful, easy and actually hangs together. These would not stay together for us either. I used a food processor for the chick peas to get them well mashed and also refrigerated the mixture over night. We had to add two eggs to get them to work. Still tasty though! I’m sorry this didn’t turn out perfect for you. Thanks for the feedback, Jessi!